Are you ready to see what new window treatments or window tinting can do for your home or business? If so, contact Newco Solar Solutions today and get started on your project! Have you noticed your walls, floors or furnishings have begun to fade? When these features of your home are in direct sunlight for hours on end, they can become damaged. With window treatments, you’ll be able to add protection to your home. Window treatments are a great way to increase the energy efficiency of your home. They are great at lowering energy bills by reducing the heat that comes in your home during the summer and keeping out cold air in the winter. Window tinting is a practical addition that can add resale value to your home. It is an easy investment to make on your home in Vancouver and the lower mainland. Adding window treatments to your home or business is an easy way to add a modern, natural feel to your décor. They are also perfect for preserving views and letting the right amount of natural light into an area. Whether your windows need privacy screens, roller shades, or skylight covers, we have the solution. At Newco Solar Solutions, we take tremendous pride in our products. Accordingly, we support our manufacturer Phifer's recent decision not to sell to their largest customer as that company switched most of their purchases to a company with lower quality products for cost savings. We understand that price is very important, however quality is as well. Like Phifer, we're committed to providing our customers with the highest quality of products. We only carry North American made fabrics and components so we can offer our customers quality window coverings that will give years of longevity. For more information, you can read the memo from Phifer here. Contact us today for your free in-home consultation. 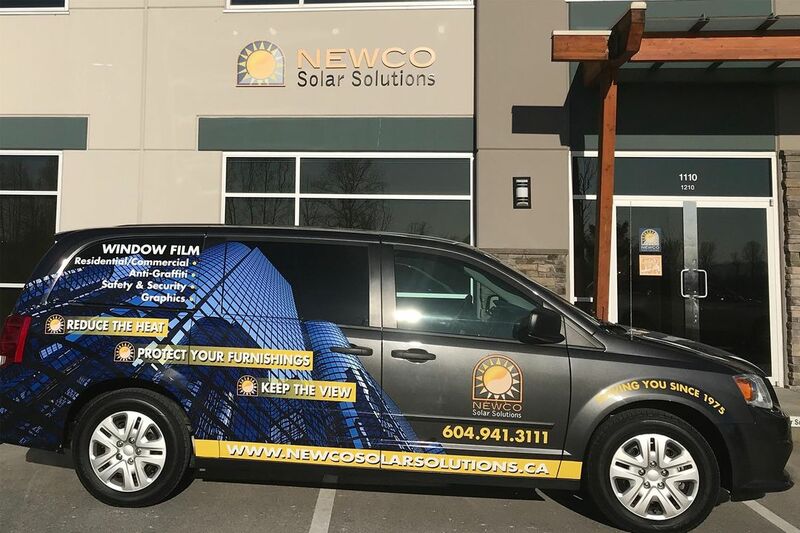 You always come first at Newco Solar Solutions. With over 40 years in the window tinting business in Vancouver, we know you deserve the best-in-class products, reliable warranties, courteous service, and affordable prices – so that's exactly what we offer. From our showroom in Port Coquitlam, we serve the entire Vancouver and Lower Mainland area. We welcome you to visit us during business hours, but we're also happy to visit you and provide a home or office consultation. To learn more about solar solutions for your windows, browse our product pages using the menus above, or call us at 604-941-3111 to request an estimate.